When Nick Colgan, former producer of band UB40 and creator of Garden Music Festival, decided to move to Zagreb and open a brewery, this city benefited in many ways. The bar for beer crafting was raised and Colgan’s great taste in music resulted in some of the most fun concerts I have attended lately, including Grandmaster Flash, Lee Scratch Perry, Mad Professor and many others. 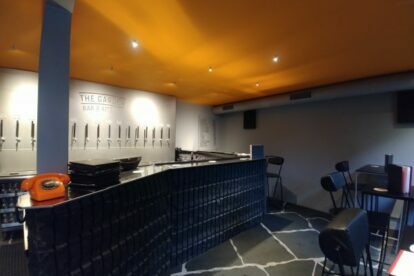 The Garden Brewery first opened a bar and production facility in industrial zone Žitnjak, but in March 2018, The Garden Bar & Kitchen was opened in the center of the city. I am a regular customer in The Garden Brewery, but the location is a bit out of the way from local transport. A Garden Bar in the center meant my favorite beers were finally much easier to reach. I am a Pale Ale kind of person and Garden’s Citrus IPA is what I like to order most often. The citrus flavor makes it really refreshing, but that floral honey note that stays after every sip is why I like it the most. My friends on the other hand, all have more than one favorite here. It’s not only the beers that make Garden stand out for me among others, it’s also that relaxed, friendly vibe I get every time I’m here, combined with the good music and good foods that perfectly accompany the beer. Garden is more than a brewery, bar or kitchen: Garden is a positive mindset with great ideas on bringing good people together.